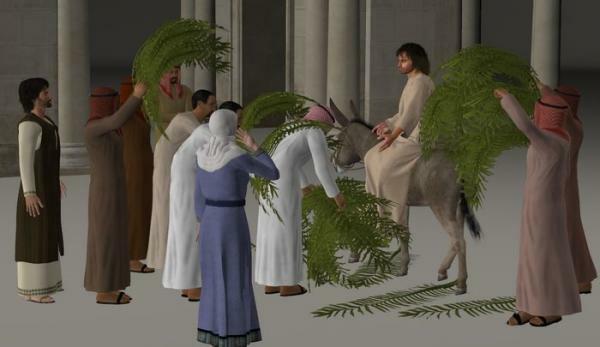 A 17-pose DS4 set for M4, M3, V3, LoRez Arab, DAZ Donkey, and LoRez Donkey depicting the Triumphant Entry into Jerusalem. Also used were palm branches, Dynamic Robe for M4, M3 Shepherd, and V3 Biblical Gown. Another excellent option would be the Monk Robes for Genesis 2 as the robes can be used without the hood, making them a good option for biblical themes. Combining this with your other pose packs and poses I've gotten elsewhere, I can now do the entire week from Palm Sunday to Easter. I appreciate this, Skylab; I'll try to make good use of this and any other pose packs you do.